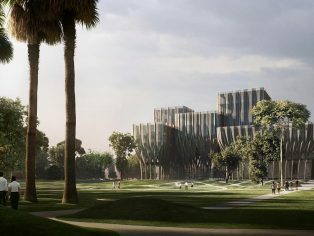 The Sleuk Rith Institute brings together a museum, research centre, graduate school, library for the Documentation Centre of Cambodia’s one million documents in its archives. Chhang is the Founder of the Sleuk Rith Institute and Executive Director of the Documentation Centre of Cambodia established by Yale University. The Institute’s name Sleuk Rith means ‘the power of the leaves’. Cambodian religious leaders have used dried leaves for centuries and scholars to document history, disseminate knowledge, and preserve culture during periods of harsh rule and grave peril. During the 1970’s Youk Chhang, at the age of 15, was a prisoner under the Khmer Rouge and members of his family were victims of the regime. Through his Documentation Centre of Cambodia, he has spent more than a decade amassing details of atrocities committed by the former Cambodian regime, The Democratic Kampuchea (DK), which is also known as the Khmer Rouge. Despite the tragic history explored at the institute, Youk Chhang’s research led to the very considered brief for a building that promoted reflection and reconciliation, and also inspired and innovated. The Sleuk Rith Institute will not focus only on the past, but rather seek to create an institute that will also be enlightening; a place for new generations to learn from the lessons of the tragedies of the past while exploring ways to heal, and move forward. “It is this commitment, determination and belief in our future that will define us,” explains Chhang. The institute’s design is organised as five wooden structures that are separate volumes at ground level, but interweave and link together as they rise upwards; connecting the different departments, visitors, students and staff within a singular whole. With an overall footprint of 80m x 30m at the base and 88m x 38m at roof level, the structures range between three to eight storeys. Each of these five buildings will house a different function: the Sleuk Rith Institute; a library holding the largest collection of genocide-related material in Southeast Asia; a graduate school focussing on genocide, conflicts and human rights studies; a research centre and archive to influence national and regional policies and discourse; a media centre and an auditorium that can be used by the institute and the entire community. As they gain in height and coalesce, the Sleuk Rith Institute’s five buildings define an intricate spatial composition of connecting volumes; generating a series of exterior and interior spaces that flow into each other to guide visitors through the different areas for contemplation, education, engagement and discussion. The institute includes a 68,000 sq.m. 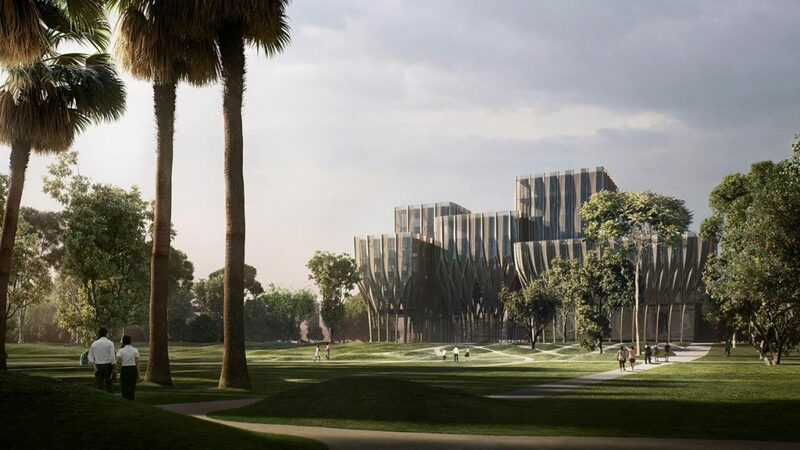 memorial park for the entire community with sport fields, urban vegetable garden and fruit orchards, traditional meadows and a forest that will house contemporary Cambodian sculptures, many of these commemorating the women that helped to rebuild the country.